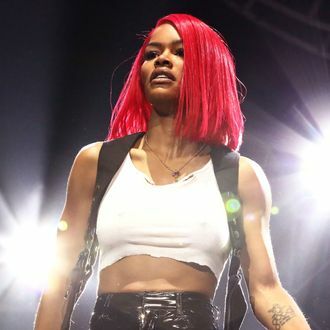 In an alternate world, Teyana Taylor’s K.T.S.E. would be a widely recognized highlight of 2018, and one of the best of the crop of Kanye West–produced albums from the beginning of the summer. In that same alternate world, Kanye’s antics would not have overshadowed Taylor’s very solid, very low-key work. Prior to right now, this alternate world seems like a purely hypothetical exercise in utopian wish fulfillment, except how else can we explain the existence of this remix of “Gonna Love Me,” featuring Wu-Tang’s Ghostface, Method Man, and Raekwon. This version of “Gonna Love Me” — melancholy, unassuming, and beautiful — is miles ahead of the other Wu-Tang showcase from earlier this month. That song, a seeming exercise in wish fulfillment by Logic, was overly long, sort of boring, and treated the members of Wu-Tang like baseball cards. He collected them all, but to what end? “Gonna Love Me” feels more thought through — Raekwon and Ghostface are already a classic pairing, and Method Man in his prime excelled at sad, dusky love songs like this. In recent years, Kanye’s production has taken a back seat to his celebrity and conceptual bombast, but it’s worth remembering that he is a master at flipping soul loops, or letting them ride out for just long enough to get his point across. In this way, he is not unlike RZA, the Wu-Tang architect who changed rap production forever. This remix isn’t going to break down the entire internet, but it sounds like vintage Wu-Tang, and that’s great.